This post is from contributing writer Mary Voogt of Just Take A Bite. Every parent wants their kids to be good eaters, right? No complaining. No throwing food. No refusing to eat vegetables. It’s a reasonable desire. 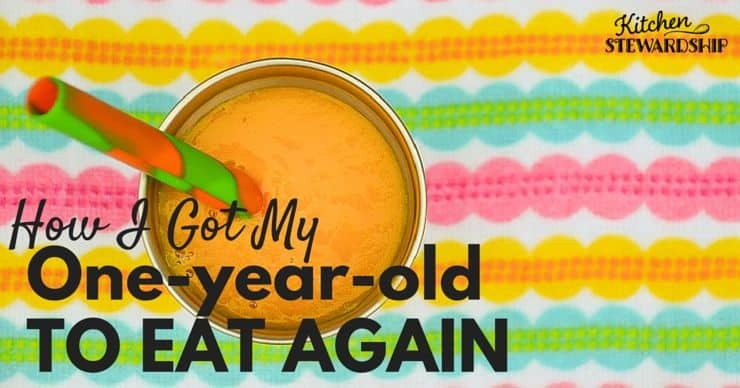 Of course most kids do go through phases of eating more or less, phases of liking and refusing certain foods, phases of wanting to make their own food choices and willingly eating whatever you serve. Love it or hate it, that’s life. Thankfully it seems to get easier to handle with each child. But what if your child just won’t eat? Emotions turn from annoyance to anxiety. I’ve been there. And I know I’m not alone. It’s not getting any better. As allergies are on the rise so are eating struggles. Especially for young children. Think about it for a minute. If you eat something that upsets your stomach do you feel like eating? Are you a little hesitant to eat that food again? Now imagine if you are so young you can’t even verbalize how you feel. And your mom tries to feed you the same food over and over (because we’re told to keep trying, eventually they’ll like it) that you know will give you a stomach ache or reflux or even swelling. What is your solution? Refusal to eat. Period. Feeding a young child that is developing allergies is an important and sometimes stressful task. As a parent your only feedback is watching for reactions, assuming you even know to look for them! Along the way your child may just stop eating out of fear or because she simply does not feel good. I have lived this struggle over the past year and a half as my daughter slowly developed more and more allergies. 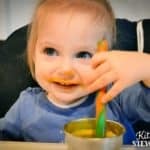 When we first introduced solids she seemed to enjoy most things she tried. But gradually she started eating less and less until she stopped eating. We managed to get by for a while because she was nursing full time. But as we approached her first birthday I knew something had to change. A one year old should be eating more than three bites of solid food a day. This is my third child. I know all the tricks. I tried different flavors and textures. I tried distracting her. I fed her in a chair or while we were playing. Really. I had tried it all. But she still wouldn’t eat. She wasn’t gaining weight. She wasn’t getting enough nourishment. At thirteen months old I knew I had to change our situation or take her to the doctor. In a last ditch effort I made her some squash “milk.” She had so many foods she reacted to I couldn’t make a regular smoothie of any kind. No dairy, nuts, alternative milks, eggs, bananas, avocados. There were only a couple of fruits she could eat. So I had dismissed smoothies a long time ago. But I gave it a shot. It consisted of water, squash, grated liver, olive oil, sea salt, collagen (use the coupon KS10 for 10% off!) and maple syrup. A good balance of starch, fat and protein with extra vitamins and minerals mixed in. I skipped the sippy cup and used a regular cup with a straw, which she thought was great. To my joy and amazement she drank it all. The ENTIRE thing! This was the most solid food and nourishment she had consumed in months. I may have even cried. And promptly made another. I got my one-year-old to eat again!! With that one drink she realized that not everything would hurt her tummy. It was safe to eat. And boy was she hungry!! A simple, allergen-friendly smoothie perfect for adding nutrients to a young child’s diet. Combine all of the ingredients in a blender. Blend on high until well pureed and foamy. Adjust the squash/collagen (use the coupon KS10 for 10% off!) (use the coupon KS10 for 10% off! )/maple syrup/salt ratios to taste. Serve in a sippy cup or a regular cup with a straw. Squash milk can be served and stored at room temperature all day. Refrigerate if saving over night. ** The squash or pumpkin can be replaced with sweet potato, avocado, carrot or banana. ** If your child has never had collagen start with a smaller amount and increase it each time you serve this beverage. We reached our turning point. 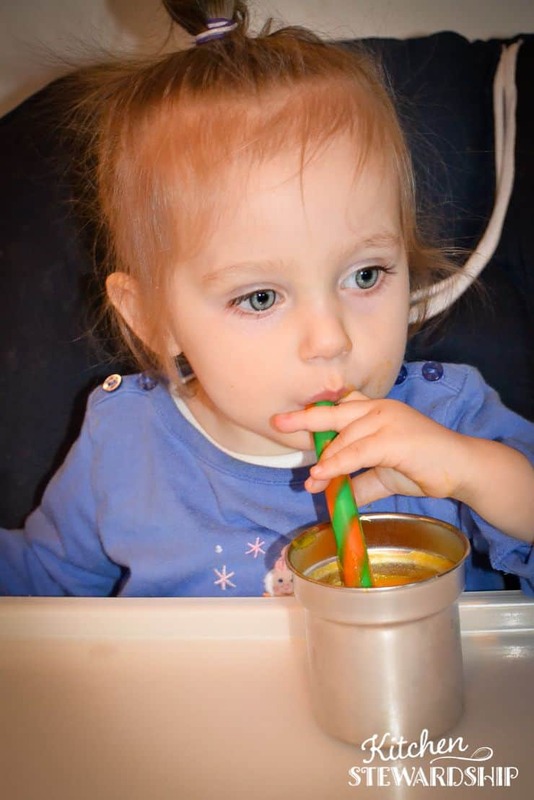 My daughter’s health and life were saved with a smoothie made out of squash. Of course it was a gradual process to get her to eat more solid food. We still had many bad days and setbacks. But we never went back to day after day after day of refusing to eat. And every time we got derailed we went right back to a simple pureed drink to get her tummy settled and get the digestive juices flowing. My daughter is now 18 months old. She eats three meals a day plus snacks (in addition to still nursing full time). She is still making up for lost time and just starting to gain weight at a normal pace. But her eating has improved immensely. Through our journey I have learned so much about feeding a young child with developing allergies. I have even used my strategies to get my four-year-old to eat when he has a tummy bug or an allergy flare. It works with all ages. I’m so excited to share what I’ve learned in my book Why Won’t My Child Eat?! I lay out step by step how to go from square one (refusing to eat anything) to having a great eater. This book is for parents with any feeding challenges, whether it be allergies, food sensitivities, picky eating or even oral sensory processing disorder. Maybe you don’t even realize your kids have food issues. You might be surprised. I lay out all of the signs to look for (including things like tantrums and bad breath) and how to observe your child. 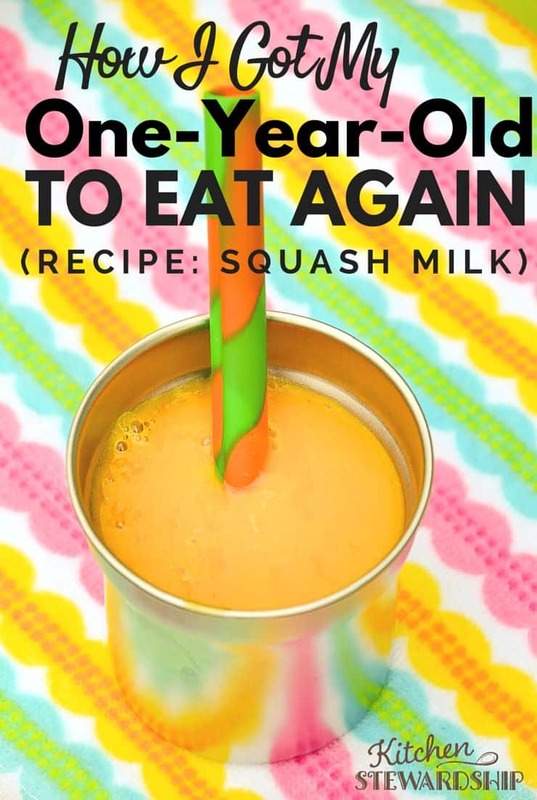 I’ll give you a sneak peak into the book today by sharing my recipe for squash “milk.” It is gentle on the tummy and perfect for kids with a wide variety of allergies. I still give it to my daughter a couple times a week to make sure she’s getting enough nourishment. I even make it for myself sometimes! My diet is the same as hers while she’s nursing. I need nourishment too! Squash “milk” is easy to make. Any variety of squash or pumpkin will work. You can stick to the base recipe or add in all sorts of nutrition boosters and tummy tamers. Toss it all in the blender and you’re done. Say goodbye to tummy aches. Say farewell to the refusal to eat. Are you ready to have a good eater again? It is possible! I can’t wait to show you how. Check out my book Why Won’t My Child Eat?! to learn more. Mary is a Christian, a wife and a mother of four young children. She has a passion for real food and can help you navigate the world of feeding challenges and picky eating. 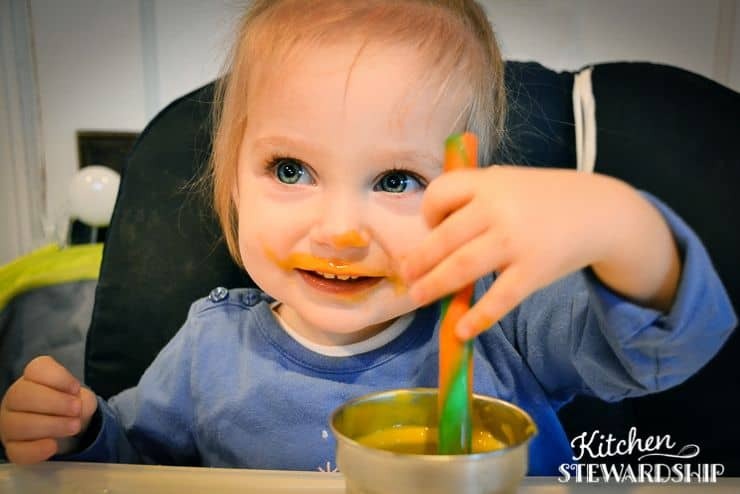 She blogs about her journey to heal and nourish her family at Just Take A Bite. I appreciate your struggles and understand your concern because your child wasn’t gaining weight. On the other hand, a child who is otherwise healthy and nursing full time does not necessarily have a problem if they aren’t eating solids by their first birthday. Neither of my boys took to solid food until well after their first birthdays. I worried at the time with my first, but hindsight tells me that it was just fine. Some kids just aren’t interested until later. That is true, Alison. Good to point that out. For my daughter “nursing full time” was still not that much. She nursed about every 1 1/2 hours but never more than about 2 minutes at a time. She was pretty proficient, but still not getting enough. My son was similar with solids, not interested until close to one year. But he was growing well and nursing well. So I had no concerns. I’m a little nervous about feeding my toddler raw meat. Will cooked liver work as well? We have some liver in the freezer from one of our goats and I would love to make good use of it! You can use whatever you feel comfortable with, Teresa 🙂 But to ease your mind freezing the liver for 14 days kills any bad stuff. Also when liver is left raw the nutrients are more in tact and easier to digest. That is why it is good for small children. Otherwise you can try desiccated liver powder. I hope you enjoy it! Glad that worked for you! I had a non-eater too. Truly starving herself and going most of the day on barely anything. It was traumatic. Praise God for GAPS helping me to get over her addictions and persevere in getting broth. It’s so scary when our little ones are not doing well. My DD eats everything now and is so much happier too. I don’t worry about not eating much food when fully nursing and doing well (not eating table food till after 1yo is typical) but glad you saw that wasn’t enough for her and found a way that helped. Happy to hear you got your little one to eat, Jen! It is so hard. My daughter was never very good at nursing due to tongue swelling (from unknown allergens) and a tongue tie (which we clipped twice). So a “full” feeding for her was about 2 minutes long. Just barely getting through the letdown. So even though she nursed every 1 – 1 1/2 hours she wasn’t getting much and not gaining weight. My 9 month old is refusing to eat and I think it’s due to allergies/intolerances as well. It makes sense that their tummies hurt and they just straight up refuse everything! I will have to try this soon. I just started collagen myself to heal leaky gut. I have not seen where people give collagen to babies! Is this a thing? Where did you get your info? I wonder if I should wait until he is 1? So sorry to hear that, Kori! It is so hard to have a child that is reacting to foods and won’t eat. Collagen is what is in bone broth. So I don’t see why it would be a problem to give to a young child. I’ve been giving it to my daughter since she was 5 months old. No need to wait. This squash milk is great! But I also highly recommend getting the book as it will answer a lot of your questions and save a lot of time and frustration. Best of luck!! That’s great you were able to figure out something for her to eat! It’s always nice to read articles like this. (: I’m wondering, what purpose is the activated charcoal intended to serve? Usually, it’s recommended to not take it with food as it can absorb nutrients. Good point, Carter! Yes, the ideal way to take charcoal is separately. But sometimes it’s more important just to find a way to get it down. I only add the charcoal if my child is in a really reactive state/has just had a reaction of some kind. It helps to settle everything.